Tools for Success: This resource gives National Drug and Alcohol Facts Week® event planners promotional “tools for success” using traditional and social media channels. The presentation includes examples of how to create a press list and pitch letter, manage onsite media and appropriate follow up after the event. In addition, event holders are given social media examples to promote their events via Twitter and Facebook. Informed Families Campaign: Informed Families partnered with NIDA in January 2018 to deliver prevention messages during National Drug and Alcohol Facts Week® to Educators, Parents & Students throughout Florida. Check out our publications, Marijuana: Facts Parents Need to Know (available in both English and Spanish), and Family Checkup: Positive Parenting Prevents Drug Abuse. Also, our most popular NDAFW publication, Drugs: SHATTER THE MYTHS, is now available in Spanish. All publications are free. Interested in a drug-specific event? NIDA also has several toolkits for events that are specific to the following themes: alcohol, college-aged and young adults, drugged driving, marijuana, MDMA, opioids and other prescription drugs, teens in the juvenile justice system, tobacco nicotine, & e-cigarettes, new psychoactive substances (synthetics) and a video toolkit, which includes a teen-friendly video showing parts of the brain and their functions. We also have a general NDAFW toolkit available in Spanish. Once you have decided on your event, a resource, “How to Promote Your National Drug & Alcohol Facts Week® Event: Tools for Success (PDF, 3MB)”, is available to help promote it through traditional and social media outreach. Use of the marks is a non-exclusive license granted to the user by the agency (HHS). Such license (or permission) can be revoked by NIDA at any time, particularly if the “Guidelines for Use” are not followed. The National Drug and Alcohol Facts Week® logos, badges, and widgets may not be used to endorse any commercial product or service. The National Drug and Alcohol Facts Week® logos, badges, and widgets may not be used to solicit funds or other contributions of monetary value. 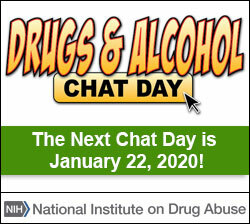 The National Drug and Alcohol Facts Week® logos, badges, and widgets may be used for informational, educational and historical purposes in connection with programs that promote information found on the National Drug and Alcohol Facts Week® website. Any other uses are unauthorized. SHATTER THE MYTHS® is a trademark and service mark of the U.S. Department of Health and Human Services. SHATTER THE MYTHS Logo is a registered trademark of the U.S. Department of Health & Human Services (HHS). Placement of the drugfactsweek.gov badges or widgets are to be used only as a marker to the drugfactsweek.gov site and a channel for drugfactsweek.gov content. The use of a widget or link does not indicate any form of endorsement or approval from NDAFW, the Coordinating Center for Health Information and Service, or the U.S. Department of Health and Human Services. Spread the word about your NDAFW events and activities. Media outlets such as high school newspapers, local news stations, radio programs, and city newspapers and their websites are all good outlets for publicizing your NDAFW event. Here are three steps to help guide you in working with the press. Step 1: Develop a key message to deliver to the media. Before you contact the media, develop a few key talking points that will help them understand what NDAFW is and what you’re trying to accomplish with your event. Preparing these messages in advance will help you speak consistently about NDAFW and have a framework from which to answer any media questions you receive. Check out our Learn About NDAFW page for key points. Keep your information short and easy to understand. Example: Here's a chance to ask questions and get the facts about drugs! Explain why you’d like them to cover your event. Example: Give a few highlights about teen drug use from the latest Monitoring the Future study results. Include basic information about your event. Inspire people to take action. Example: Tell them they can make a difference in teens’ lives when they help spread knowledge to SHATTER THE MYTHS® around drugs and drug abuse. Make it clear to the press that your event provides a safe, honest environment to discuss drugs and drug abuse. Incorporate your key message across all of your communications channels—including pitches, press releases, social media, and other media platforms. Step 2: Create an effective media list. Each station and newspaper has reporters that cover different kinds of news. Think about which ones might be most interested in your event. For newspapers, start with the metro or local reporters. You could also contact health, youth, education, and lifestyle reporters. Look for names of reporters in those sections, or call the newspaper to get their names. Consider influential bloggers in your area that cover issues related to health, youth, or drugs and drug abuse. Step 3: Distribute press materials. A press release announces news related to your event. You can send a press release 1 or 2 days before, the day of, or the day after your event. Include details such as how many people will be/were there, and why. Be sure to follow up with a phone call after you send it! A news advisory tells the media about an upcoming event and advises the media to cover it. It should only be 1 page and include specific “who, what, when, where, why” information, plus some general information about your organization. An effective letter to the editor should be related to a recent story in the news. It should express your opinion, and you can reference your event as a supporting point. Be sure to include your age, address, and phone number. Create buzz about your event before it even starts. Post on Facebook or Twitter; add photos to your Flickr, Pinterest , and Instagram pages; shoot a video; and blog about your event. Make your post positive and include a call to action (e.g., Join Us! or Spread the Word!). Include a link, an image, or a video that relates to your event. Mention your friends, colleagues, or other organizations in your posts to spread the word even further! Need Ideas for Sample Posts? We’ve provided sample Facebook status updates that you can easily copy and paste to help let folks know about your event. Be sure to like the NIDA Facebook page and tag us in your posts! January 22nd is the start of National Drug and Alcohol Facts Week®! Look for questions on our Facebook page each day to see how much you know and get the REAL facts [include link to NIDA for Teens site or the NIDA Facebook page or to the National Drugs & Alcohol IQ Challenge [Include an image—See our Flickr page for ideas]. Did you know National Drug and Alcohol Facts Week® is coming up from January 22-27? [Your organization name here] is partnering with the National Institute on Drug Abuse to [events details here]! Be sure to follow our page for more details as the week unfolds [include link] [include image or video—See our YouTube page for ideas]. We’re [event details here] for National Drug and Alcohol Facts Week®! Share with us how you’re getting involved this week [tag other participants]. Whether you tweet about your event to get people to attend, live tweet at the event itself, or help to SHATTER THE MYTHS® about drugs by tweeting the facts, be sure to use the hashtag #NDAFW. Use the hashtag #NDAFW in every tweet. Avoid shortening “you” to “u” and “are” to “r” and similar tricks. Include a link, as well as an appropriate image or video. Mention your friends, colleagues, or other organizations in your tweets to spread the word even further! Need Ideas for Sample Tweets? We’ve provided sample tweets that you can tailor and post on your own Twitter account. Be sure to follow @NIDAnews and @NIAAAnews and mention us in your tweets! We’re [event details here] for #NDAFW! How are you getting involved? NIDA would love to see your NDAFW images! Customize your Flickr, Pinterest, Instagram, or other visually interesting page using pictures from your events and NIDA images. Make sure to take pictures at your events! Visit the NIDA Flickr account for images. Check out all of our Downloads. Include this Release Form [PDF, 82KB] with any photographs, audio files or videos that you share with NIDA. Make your own video of your NDAFW events and share! Check out what other NDAFW event holders have done! We have numerous videos on our YouTube account that you can share with your friends through social media. You’ve worked hard to make your event a success. Tell the world about it! Your NDAFW event makes a great blog post. Use our sample blog post or create your own! Keep your post short and easy to read. Make the title interesting and to the point. Include links to appropriate sites, such as the NIDA for Teens or NDAFW websites. Need Ideas for Posts? Here is a sample blog post to help you get started. You may or may not know how passionate I am about protecting teens from the dangers of drug and alcohol use. Did you know National Drug and Alcohol Facts Week® is coming up from January 22-27? During that week, I’m joining with others to help teens SHATTER THE MYTHS® about drug and alcohol use. Teens are bombarded with conflicting messages that can leave them feeling confused and unsure of who to ask for information about drug use. With 12% of 12th graders reporting abuse of prescription drugs in the past year and 22.5% reporting use of marijuana in the past month, there is no better time than now to help teens understand the serious consequences of drug and alcohol use (data is from the Monitoring the Future Study: Trends in Prevalence of Various Drugs). [Your organization name here] is partnering with the National Institute on Drug Abuse and the National Institute on Alcohol Abuse and Alcoholism to [events details here]! Be sure to visit our Facebook page [name/link here] for more details as the week unfolds [include link] [include image or video—See our YouTube page for ideas]. We’re [event details here] for National Drug & Alcohol Facts Week®! I’d love to hear how you’re getting involved. Observe first – You may want to participate in a chat before hosting your own. This will give you the chance to see what they’re like and learn a little more about your community and audience on Twitter. Choose a theme – What topics are relevant to your online audience or local community? Consider others in your community who might also participate in this topic. Pick your hashtag – Use a hashtag to help your participants follow along by picking something that is easily identifiable. May we suggest #NDAFW? Prepare your Twitter chat team – Some Twitter chats can become tough to manage if you have a lot of participants. If you are able, consider asking members of your team each taking a specific role to help keep things organized. At NIDA, we like to have at least one person post content and one additional person to keep an eye out for audience questions. Promote your chat – Don’t forget to let people know about your chat ahead of time! Promote your chat on your social media and any other channels you use to reach your audience. If you’re hosting an event with speakers or panelists, you may want to consider livestreaming on Facebook, Twitter or another social media platform. You can also host a Q&A on Facebook Live, either as a follow-up to a lecture or on its own. Here are some tips from HIV.gov for hosting a Facebook LIVE Q&A session. For more tips, check out their blog: https://www.hiv.gov/blog/live-from-facebook-its-aids-gov-lessons-weve-learned-so-far. Print out this template and fill in your information. Print flyers yourself or print them at a print shop of your choice. Hang them everywhere teens are. Download flyer size [PPTX - 142KB] or download poster size [PPTX - 148KB]. Use your creativity to make a flyer or poster. You can get ideas from past events by looking through Previous National Drug and Alcohol Facts Week® Events (scroll down to “Check Out These NDAFW Event Posters!”) Don’t forget to use our NDAFW logos. For posters about drugs and drug abuse, visit our Order Free Materials page. Want to make your own gear? Download for FREE below. A proclamation is an official designation of an event issued by governors, mayors, county executives, state legislators, counties, cities, or towns. It’s a great way to get some public recognition! How can I get a proclamation issued? Contact your local government official's communications office and ask what action is needed to designate January 22-27, 2019 as National Drug and Alcohol Facts Week® in your community. Contact information can usually be found online. What should a proclamation say? The proclamation should declare January 22–27, 2019 as National Drug and Alcohol Facts Week® and be signed by your local government official. This notes that he or she supports the observance. The proclamation should discuss the importance of this week, as well as the importance of teens asking questions and getting good, solid scientific answers. Take a look at our Sample Proclamation [DOC - 164KB] and revise it to meet the needs of your community. Send the proclamation to local health organizations and local government officials, including the mayor or governor and encourage them to display the proclamation, especially on their websites. Then, send it to us at drugfacts@nida.nih.gov. We will post proclamations from across the country!